Tech Contracts Academy™ / Articles / Don’t redline a redline. Talk! You’re negotiating a contract, and you send your company’s standard form agreement. The other party then marks it up — “redlines” it — and sends it back. What should you do now? Your instinct may be to accept some changes and reject others, and maybe write up a few compromise terms. You create a new redline and send it back. Bad idea! Unless you’ve accepted all but the other side’s most minor changes, a new redline will probably waste time. And it may sour the relationship. It doesn’t matter whether you’re at the start of the contract negotiation, as in they hypo above, or in the middle or near the end. In most cases, the response to a redline should be a conversation, not another redline. If you don’t talk, you won’t know the reasons behind the other party’s redline. 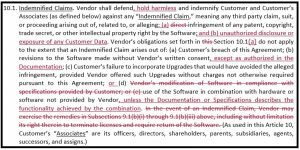 Did the other party delete your indemnity clause because they don’t understand it? If so, just putting it back won’t help. Did they refuse your employee background checks because they’re illegal where the staff works? Did they delete your business continuity terms because you’ve misunderstood their disaster recovery system? 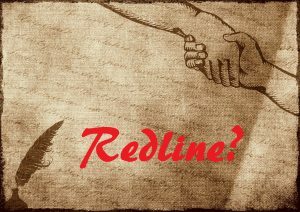 How will you know if you just redline? Redlining a redline also make compromise difficult. Sure, you could suggest compromise terms in your new draft. But you’re just guessing what the other party wants. You’d compromise better and faster on a phone call. A redline without a conversation can also insult the other side. “They just crossed it out? What jerks!” You can always cross out the other side’s terms after a conversation, but it’s rarely insulting when you’ve listened first. I’ve done a zillion contract negotiations (possible exaggeration), and I’ve seen the effective ones follow a predictable pattern. One party sends its form contract and the other redlines it. Then the two talk about the redline — usually led by the receiving party, who points out the problems with the other’s suggested changes. Only then is it time for the next redline. The party who received the last draft marks it up, incorporating whatever agreements the two reached during the conversation. Where issues remain open, that party inserts the terms it wants, ideally with a polite note reading, “we haven’t agreed on this, but FYI, here’s what we want.” Then it sends the redline. What’s next? If the new draft doesn’t lead to signature, you repeat, with the parties switching roles again. And you keep repeating until it’s done. Of course, there are exceptions. Redlining a redline can work if the contract negotiation is almost done, for instance. If you only have one or two non-controversial edits, or if you’re at “take it or leave it” anyway, a conversation might not help. And sometimes, you can’t talk. But where possible, I recommend the pattern above. I recommend talking between drafts. I’m not promising a smooth conversation. You may bark at each other. But you’ll get it done faster.